Scripps Institution of Oceanography scientist Detlef Stammer contributed this article about the COMPAS ocean and climate modeling project, a partnership that includes Calit2, IBM and the San Diego Supercomputer Center. UCI professor Lisa Naugle, an academic participant in Calit2's New Media Arts layer, recently organized a distributed dance performance, combining live performances at UCI and New York University. As Shellie Nazarenus reports, music and video were transmitted in both directions over Internet2. UCI professor Will Recker, campus Calit2 layer leader for Intelligent Transportation and Telematics, takes the wraps off California's largest shared-use station car initiative. Shellie Nazarenus reports the ZEV-NET project combines the Internet, fuel cells, electric vehicles, research and shared-use together to solve complex problems like traffic congestion, air pollution and oil dependency. In a report on the future of 802.11b, so-called "Wi-Fi" wireless, technology writer Jon Van says the Calit2-sponsored CyberShuttle "that marries 3G and Wi-Fi may provide a glimpse of this hybrid future." Writer Bruce Bigelow reports on Calit2 industry partner Enterprise Partners' hiring outgoing UCSD Jacobs School dean Bob Conn, effective July 1, noting Conn's role in formation of the institute. In the publication's 3,700-word report on grid computing, the May 2002 cover story, M. Mitchell Waldrop quotes Calit2 director Larry Smarr extensively on the prospects for "a new kind of utility that offers supercomputer processing on tap." Interviewing Calit2's Ramesh Rao and others, staff writer Anica Butler reports that "UC staff and students on a campus shuttle stay connected while they try out new technology allowing faster mobile Internet access." The news service reports that the "UCSD shuttle project is one of several conceived" by the California Institute for Telecommunications and Information Technology, a partnership between UCSD, University of California, Irvine and several private-sector companies to promote advances in telecommunications and information technology in California." UCSD and Calit2 have "added a cyber shuttle that provides 2 Mbps... wireless access to passengers being ferried around campus and to a nearby train station," reports Brian McDonough. Calit2's Ramesh Rao and other researchers call the high-speed Web-enabled vehicle "a glimpse into the future of ubiquitous computing," reports Florence Olsen. This online PC enthusiast's resource showcases a detailed but engaging 5-part account of testing Qualcomm's 3G wireless technology, by John Kleint, a summer 2001 undergraduate Calit2 Fellow. Bruce Lieberman reports on the high-speed Web-enabled bus, calling it "one of several conceived by [Calit2], which is pioneering the new technology. The online news service features the Calit2 Visualization Center at Scripps in a report titled 'Earth Data Screened as 3-D Wall to Wall Images,' noting that the 3-D visuals dramatize data showing the impact of global warming on Earth's climate and oceans. Calit2 "is developing new ways to use the Internet so that scientists, emergency personnel and public officials can better share information during a crisis," reports science writer Bruce Lieberman on anti-terrorism battle in San Diego. On March 21, the California Assembly adjourned until early April, without taking a vote on legislation that would commit the state to issuing lease-revenue bonds to raise $50 million for Calit2. That amount would represent the rest of California's capital commitment to financing construction of the institute's planned buildings at UC San Diego and UC Irvine. As T Sector's Amy Johnson Conner reporting for the online news service ahead of the adjournment, the Assembly is largely divided along party lines. Calit2 director Larry Smarr is quoted on NBC's San Diego TV station about the launch of the new visualization facilities at UCSD and San Diego State University. In this report for the CBS affiliate in San Diego, reporter Shawn Styles profiles the new Calit2 Visualization Center at Scripps--and how it can be used to follow seismic activity. Writer Jeff Ristine mentions Calit2 in this report on the work of UCSD chemist Michael Sailor, on sensors that "ultimately could lead to a new generation of cheap, portable nerve-gas detectors." In a feature about the new visualization centers linking the two universities, staff writer Bradley J. Fikes reports that Calit2 "is considering broadening the UCSD/SDSU partnership into a crisis management system for the San Diego area." VREfresh featured the launch of Calit2's Visualization Center at Scripps as its lead story. 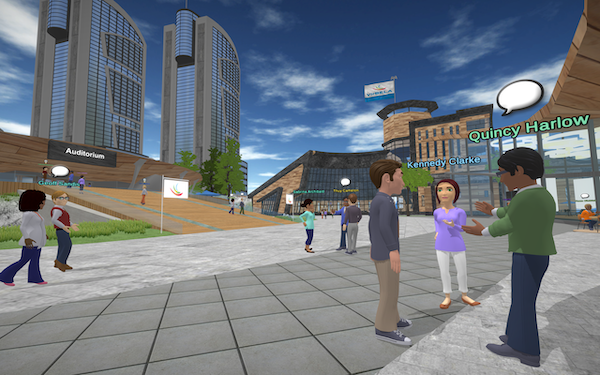 The online publication covers advanced interactive projects run by the European Commission's Interactive Technologies program. The paper's science writer Bruce Lieberman reports on the Calit2 linkup between UCSD/Scripps and SDSU, "connecting experts separated by geography so they can simultaneously analyze huge amounts of data." In a Special Report on development of the Semantic Web led by Tim Berners-Lee of the World Wide Web Consortium (W3C) to replace the World Wide Web, technology reporter Otis Port quotes Calit2 director Larry Smarr and UCSD/San Diego Supercomputer Center faculty participant Chaitan Baru. Calit2's Robert Nideffer, assistant professor of studio art, UC Irvine, is one of 3 UCI artists chosen for Whitney exhibit. Nideffer will show his Internet piece titled "Proxy." Friday, February 22, a 5.29 quake was felt near the town of Calexico. The UCSD Anza group (led by Frank Vernon, research seismologist at SIO and Calit2 participant) operates a broadband seismograph network. Their web site posts maps on current seismic activity as well as recorded data from previous earthquakes. In a full-page profile, reporter Brad Graves says Calit2 director Larry Smarr sees himself on a life-long program of learning. In its March issue (due on newsstands Feb. 26), the publication carries a 2,500-word Q&A with the Calit2 director, calling Smarr "a master facilitator, bringing people and institutions together to work on key technological challenges." More than 400 computer science and engineering freshmen at UCSD are sporting wireless-enabled Hewlett-Packard Jornada PDAs as part of a social and educational experiment, reports the San Diego Metropolitan in the San Diego Scene column of the magazine's February issue. The online technology news service reports on Calit2's partnership with the Southern California Next-Generation Internet initiative, and quotes CalNGI's Mike Vildibill as saying Calit2's participation brings a different perspective, particularly in wireless communications--"a cornerstone of the next-generation Internet." Sunday, February 3, a 4.0 quake was felt near the town of Julian. The UCSD Anza group (led by Frank Vernon, research seismologist at SIO and Calit2 participant) operates a broadband seismograph network. Their web site posts maps on current seismic activity as well as recorded data from previous earthquakes. In a recent report on the NBC station in San Diego, reporter Vic Salazar interviewed Calit2 UCSD transportation layer leader Mohan Trivedi about new technology under development for computerized facial recognition and other types of biometrics. In the January issue of the online magazine sponsored by Calit2 industry partner Hewlett-Packard, Rick Mathieson calls San Diego a "world-class Mecca for wireless innovation," and notes that it is "no surprise" that the Jacobs School of Engineering and Center for Wireless Communications have made UCSD "one of the world's most prominent centers for wireless technology development." In early January, the syndicated TV program Business Now featured Calit2 and director Larry Smarr in a report on one of the institute's industry partners, TeraBurst Networks. The report aired on ABC-owned stations. In its annual Tech Newsmakers issue, the San Diego-based publication named Calit2 the newsmaker of the year in the "community" category, noting that "the business and community press followed the Institute's progress throughout 2001." Jacobs School of Engineering dean Bob Conn (right) was cited for his role in bringing Calit2 to San Diego and Irvine.